Printed by Jane Coe, June the 11, 1646. Articles agreed upon June 4, 1646, Between Col. Edward Vere, Collonel George Vane, Lieutenant Col John Disney; Commissioners on the behalf of Lord Byron; And Col. Thomas Glyn, Col. John Carter, Major Hierome Sankey, Commissioners appointed on behalf of General Mitton, for the surrender of the Town and Castle of Carnarvan. That the Lord Byron, the Governour of the Town and Castle of Carnarvan, all Officers in Commission, and Gentlemen of quality, with their meniall Servants, shall have liberty to march out with their Horse, Arms, Bag and Baggage, properly to them belonging unto their severall Countries Friends, and Estates, wheresoever they are in this Kingdom, and to have liberty for three Months unmolested, to make their peace with the Parliament, or to Procure the Parliaments Licence to go beyond Seas, they doing nothing during the time, to the prejudice of the Parliament. That the rest of the inferiour Officers and common Souldiers shall have liberty to march to Worcester, marching ten miles a day, and if that town be besieged before they come thither, the Commander in chiefe at that Leagure, to bee desired by Major Gen. Mitton to give them Passes to go to their own homes, they ingaging themselves to doe nothing to the prejudice of the Parliament, and all to have free quarter in their march. That all Officers and Souldiers whatsoever, that are sick, or wounded in the Town, or Castle, shall have liberty to continue in Gen. Mitton his quarters till they be recovered, and then to have Passes to travell to their own Countries, and in the mean time to be carefully provided for by Gen. Mitton his order, they doing nothing prejudiciall to the Parliament. That neither the person of the L. Byron, nor the person of any Officer, Gentleman, or Souldier, marching out as aforesaid, be searched, molested, or troubled, upon what pretence soever, they Passing their Honours that they carry nothing but what is Articled for, and that none be entised from their Regiment upon promise of preferment, or other inducement whatsoever. That such provision of Carriage be made as the Lord Byron shall think necessary. That Sir Wil. Byron, Lieut. Col. John Robinson, Lieut. Col. Shakerly, Capt. Hassal, Capt. Alcock, Cap. Benner, Arch Deacon Price, and the Clergy men in Town have benefit of the Articles. That the Town and Townsmen of Carnarvan shall enjoy all those rights and priviledges which formerly they had, and be preserved and kept from the violence and plunder of the Souldiers. That the Irish according to the sence of the Ordinance of Parliament made in that behalf shall be prisoners. 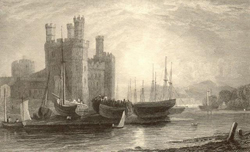 That in consideration hereof, the Town and Castle of Carnarvan, with all the Ordinance, Armes, Ammunition, Boats and Provision, without any imbezelling or defacing, and all other Provisions of warre whatsoever, with the Records therin, except what is allowed by the Articles to be carryed away, and formerly herein mentioned, be delivered up to Gen. Tho. Mitton, or to such as he shall appoint upon Saturday next ensuing, being the 6 of this instant June, by twelve of the Clocke at Noon for the use of King and Parliament. That a Convoy be appointed for the L. Byron, and such Officers, Gentlemen, and Souldiers, as shall march out, for their safe Conduct out of North-Wales. That Hostages be given on both sides for the performance of these Articles and the return of the Convoy. The copy of a Letter from Carnarvan of the surrender of the Castle, &c. to Major-Gen: Mitton, agreed to by Commissioners on both sides. In my last I advertised you of our Agreement to capitulate with the Lord Byron for the surrender of Carnarven, and six Commissioners were chosen, three for Major-Generall Mitton, and three for the L. Byron, his Lordship sent out Col. Edward Vere, Colonel John Vane, and Lieutenant Col. John Disney, and on our side were chosen Col. Thomas Glyn, Col. John Carter, and Serjeant-Major Hierome Zankey, who have effected the work, so that Carnarven is agreed to bee surrendered to us, agreed by both parties upon this treatie, and by each signed. I have here inclosed sent you the Copy of the Articles whereupon it is to be surrendered, which I hope will give very good satisfaction, and content to the State. I am sure it is a very considerable service; it being a place of great strength and of great use; And we are now to fall upon other designes for the reducing of these parts to the obedience of the Parliament, but I must tell you they are here for matter of Religion most ignorant, and brutish people; who know very little of God; and it is heartily to be wished that some honest and godly painfull Ministers would come to preach the Gospel to them, Indeede there are some Prelates, and prelaticall Clergy in Carnarven very malignant, and such as these people are like to profit but little by; except they will study to preach Jesus Christ more then for ought I can here they have done but the Country Townes hereabouts have been quite without all manner of preaching almost, but blessed be God we are in a faire way to reduce, these parts to the obedience of the Parliament, (who I doubt not) will take care to send a powerfull ministry so soone as North-Wales is totally reduced, I hope that (very shortly) you will here good newes, from Anglesay which is the place of the greatest consequence (in all these parts, this that we have taken in being very considerable also) Benmorris being a place that hath bin of great use to the King, I hope it will now be sodainly in our hands, which is of great consequence; because of the conveniency of bringing in of divers foraigne forces thither as hath been often done to serve the King against the Parliament and Kingdome. I trust in the Lord that now God will be pleased to put an end to all the troubles of these parts; that we may meete in peace. The King hath now no more Garisons maintained by his party against us in all North-Wales save only 5, and all of them either are or will be besiged (if not part of them surrenderd) within (?) deyes. Indeede some of them it may be will prove hard to be reduced, and may hold out long, our Major Generall, Major Generall Mytton is very active, even to be admired in the hastning to make an end of the worke, Collonel Glyne doth us service since he joyned with us, and truly Col. Carter, is a very pritty Gentleman, and full of action, the Country are no little glad of the hopes they have to enjoy what they have in peace; which is in a good way for them, there are in Carnarven (with the Lord Byron) many gentlemen of quality, most of the cheif of those Officers that came from Chester, some Bishops, and divers malignant clergy, the works are exceeding good and reguler, high works and thick, and deepe motes, I can not give you the certaine number of the Ordnance, Armes, Ammunition, and provisions, till we be possest of the Castle, but after we have taken a note of them I will send you a list by the first opportunity: but thus much I can assure you that they were so strongly fortified that they little thought that Carnarven would so soone have bin in our hands when Byron went thither; but blessed be God this work is not put out of question, and by the next I believe you will hear somthing both of Anglesey and Flint Castle, but this is all at present from.